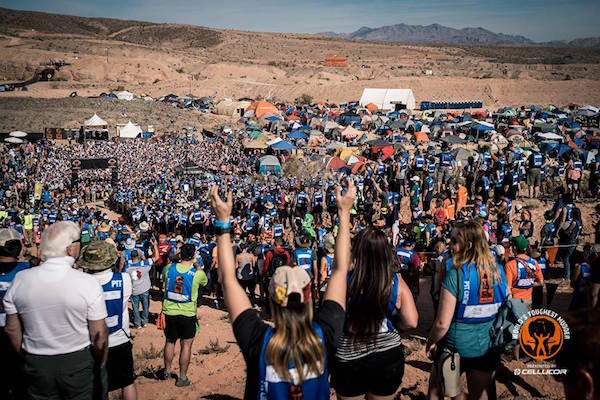 After a four-year span in Las Vegas, World’s Toughest Mudder (WTM) is moving to Atlanta. With the change of venue, we are in for a new challenge this year. I want to help you prepare for this year’s event by answering some of your questions. Before we get into the nitty gritty details about gear, nutrition, and pacing, let’s talk about that place between your ears! A strong mental game will help you push beyond the limits that you thought possible and make smart decisions throughout the 24 hours of WTM. Purpose: I want you to think about your mindset going the race. Most importantly, WHY are you running WTM? Your mindset and purpose will carry you through 24 hours and help you keep moving when everything hurts. Perspective: Think about the time allocated towards training for this race throughout the year. Based on the time spent throughout the year, create a list of priorities for the race. Your perspective will help play into the goals you create for yourself. I find it best to have an A, B, & C goal for the race. Your goals will determine the way that you tackle the 24 hours out on course. Process: Regardless of your goals or intentions for this race, make sure that you are enjoying the process of training and racing. 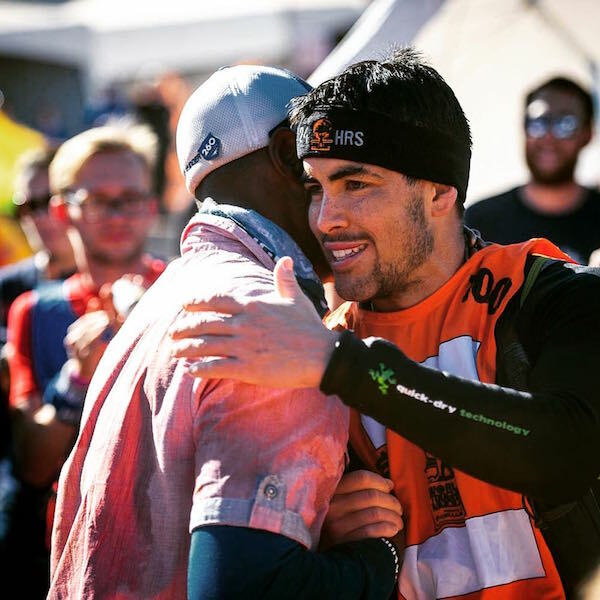 The beauty of this race is that everyone out there is running for a different reason and with a different intention, but we all share 24 hours on the course. Remember to have fun and that for 99% of us, this is not our job. WE PAID TO BE HERE!! Make sure you bring compression tops and bottoms that don’t hold water. You will most likely be getting in and out of water the entire race, so cotton is a huge NO NO! Bring an extra pair of everything you can: clothes, gloves, shoes, headlamps, flashers/glow sticks, hydration pack, wetsuit, etc. Have a medical and first aid kit with things you might need throughout the race (lubricant, bandaids, tape, ibuprofen, acetaminophen, anti-inflammatories, Pepto Bismol, antacids, Imodium, etc… I am not going to get into a discussion about the different types of medicine, so make sure you know what works for you and consult your doctor). Remember to bring something warm for after the race; you will thank me later! How many shoes do we need? Bring at least three pairs of shoes. One that you plan on starting the race in, one backup shoe with more cushioning, and another shoe that is a half size larger. Variety is king, because the different conditions of the course may call for a different type of shoe. You may find yourself needing more cushioning in the middle of the race and you may find your feet swelling therefore needing a half size larger. You never know if one of your shoes has a problem, so it’s always best to bring extra if you can. How do we know if it’s a good fit? 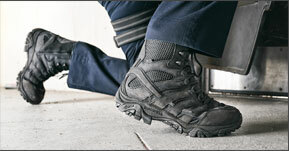 Make sure you when you stand up that your toe has extra room in the toe box. Don’t let your toes press against the end of the shoe because they will swell up during the race. Make sure that your shoes are wide enough too. Some people have wide feet and have trouble rubbing on the outside of their pinky toe, which can cause a lot of problems. I will probably say this again, but make sure you WEAR YOUR SHOES ON A LONG RUN BEFORE WTM! First, I want to make it clear that everyone’s foot is different so make sure you try the shoes before the race. Personally I’m a huge fan of the All Out Crush 2 (AOC2) and the Agility Peak Flex 2 E-Mesh for obstacle course racing. 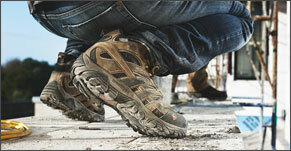 The AOC2 is a more minimal shoe with great traction, easy draining, and is comfortable. The Agility Peak 2s provide more cushioning for later on in the race. This all comes down to personal preference, so please try your shoes ahead of time. Do you buy shoes that are a size up? Definitely. You need to have at least one pair that is 0.5-1 size up from your normal shoe size. Your feet will swell during the race and you will want a larger size just in case. When do you change shoes? This definitely comes down to personal preference and how your feet are feeling. I have gone through races never changing my shoes and I’ve also found myself wanting to change after only a few miles. A lot of it will depend on the terrain and conditions of the race. Always bring the shoe with more cushioning because your feet might start hurting after a few miles. Try to make a change before any pain or discomfort becomes unbearable. Unlike a traditional ultramarathon, it is almost impossible to keep your feet dry during this race. Unless you plan on taking an extended stop to get warm or eat, I don’t see much value in changing socks because your feet are going to get wet very soon anyways. With that being said, changing socks when you change shoes could be a huge mental boost in the middle of the race. Don’t underestimate the power of how something makes you feel, even if it’s temporary. 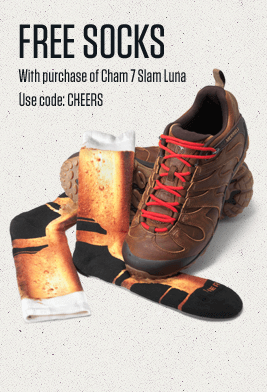 What type of socks do you recommend for hours of wet muddy conditions? It’s always good to have options. I prefer the Merrell Trail Glove Quarter Sock or the Merrell Ultra Light Running Tab Sock. I have also seen a lot of success with Drymax, Swiftwick, or Injinji (toe socks) socks as well. In order to avoid blisters, consider applying anti-chafe such as Squirrel’s Nut Butter or Vaseline between the toes. I have never been a fan of toe socks, although some people swear by them. Do what works best for you and bring options. Definitely! Make sure you bring at least one thick wetsuit. You never know what the conditions are going to be during the race, so I think it’s best to bring a couple of different options. I currently have a shorty suit, a full wet suit, and have used Frogskins in the past. If you can only afford one wetsuit, try to pick one that is thicker/warmer. Last year, I used the 2.5mm Hyperflex Shorty Wetsuit and it worked great for me. If you only bring a shorty, make sure that you bring additional layers. 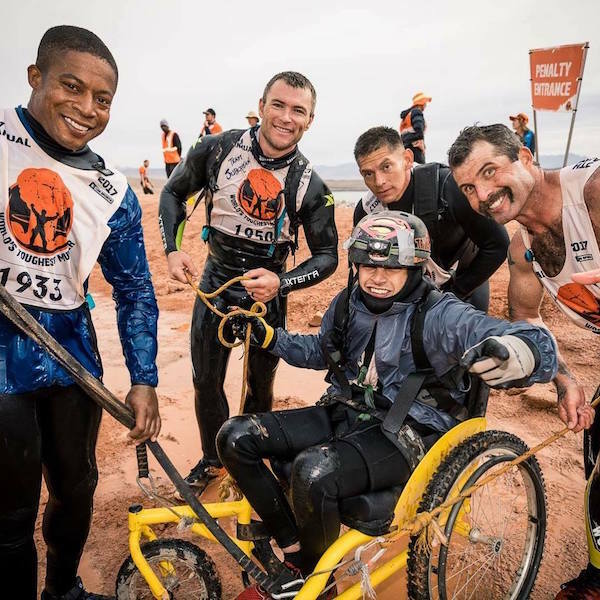 You can check out Wetsuit Wearhouse for a large selection of wetsuits to use for World’s Toughest Mudder. Pro tip: make sure you pee in your wetsuit before getting to WTM; it means you tested it out before the race! Ryan Atkins is a fan of the Zone 3 SwimRun Wetsuit. What type of gloves should I use? This all comes down to personal preference. When selecting a glove, take into consideration the thickness, especially when navigating grip strength obstacles. Thicker gloves will be harder to use on obstacles. I’m huge fan of Blegg Mits because they keep your hands warm and allow you to use your hands on the grip strength obstacles. Oh and by the way, they were created and designed by former WTM Champion Deanna Blegg. Should I bring a windbreaker? Yes, definitely, yes…you better bring one! A windbreaker is huge game changer. It allows you be more comfortable without having to wear a thicker wetsuit I’m huge fan of the Merrell Torrent Windbreaker. It’s extremely thin and lightweight and does a great job taking the sting out of the wind. What other gear do I need to stay warm? Make sure you bring a neoprene hood or a cap. Most people lose a ton of heat out of the top of their head, so this is an essential piece of gear to stay warm. Do I need a hydration bladder? This is going to depend on how fast your lap times are. 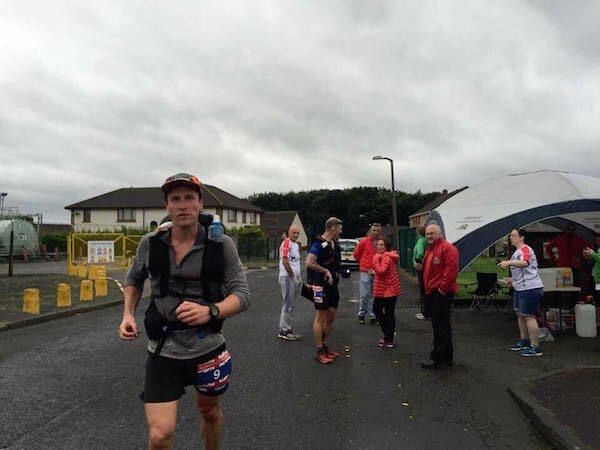 There aren’t any aid stations on course, so you need to bring everything with you. If you’re running faster lap times, a waist belt such as the Ultimate Direction Hydration Belt is a perfect option. If your lap times are longer than 1.5 hours, I would recommend bringing a vest to carry extra water. It is crucial to continuously drink throughout the race and avoid falling behind on hydration. Is there any other gear I should bring? 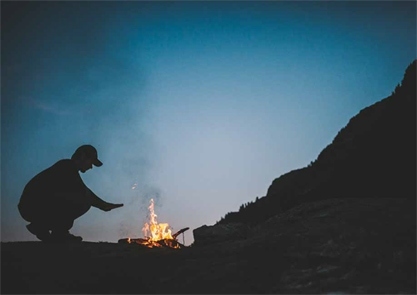 Consider bringing other items such as a cart to carry all of your gear, trail-running gaiters to keep out debris, a buff to block dust, sunglasses, garbage bags, batteries for lights, sunscreen, eye drops, lip balm, and a DryRobe. 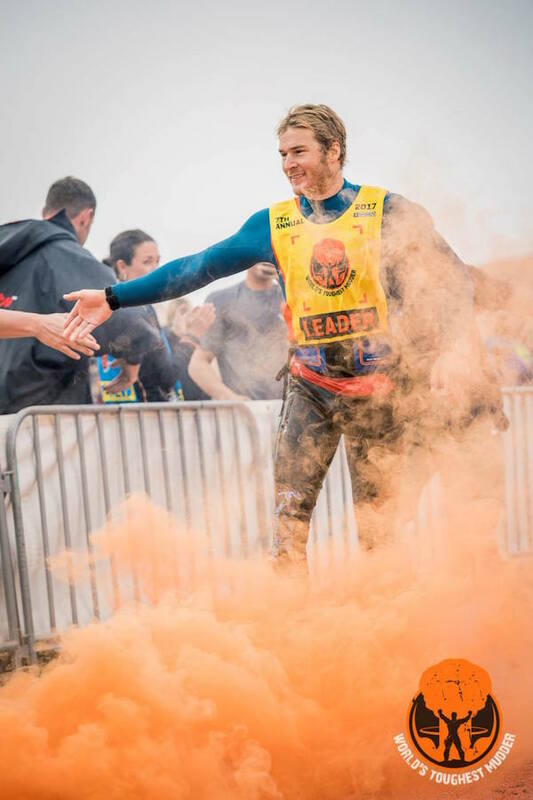 Joe Perry, a WTM and 100+ Tough Mudder legend, recommends bringing a life jacket if you are not a good swimmer. With the large amount of water obstacles, swimming can make competitors very tired. Even if you end up not using it, it’s better to have it just in case. If you’re Joe Perry, face paint is the most important piece of gear. His wife, MJ, paints his face a unique style for every single race. Make sure to say hi to him out on course! He’s not as scary as he looks! What should I eat during the race? Just like my gear recommendations, make sure you always try your nutrition prior to race day. Different things work for different people. I try to mix in Clif Blocks, GU Stroopwafels, and RX Bars for more solid food. Spring Energy Gels have been my recent go-to along with cookies. I know that a lot can change throughout the race, so I try to bring a wide variety of items. Aim to eat 200-300 calories per hour and have a ton of different options. Lindsay Webster: Loves rice with coconut oil, almond butter, and salt! Is pizza really a miracle food? Yes, but perhaps it’s best saved for after the race. Actually, there are some weird cravings that people get during the race that you may want to prepare for: pickles, salty foods, sour foods, cookies, chips, candy, etc. How many water stops or burrito stands are out on course? The Muddy Mendoza Burrito stand will be out there for you! Technically there can be one burrito stand per lap, as long as your pit crew is that burrito stand. 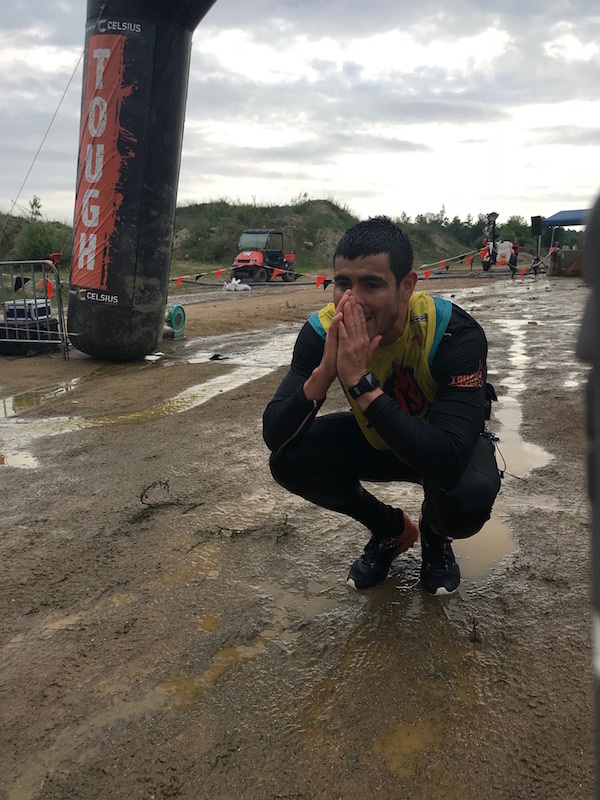 In the past, Tough Mudder did not provide any water stations in the middle of the course, so make sure you carry all of your fuel and hydration with you in a belt or pack. What should I eat for a pre-race meal? Low fiber and simple foods. To be honest, as long as it doesn’t make you sick, it doesn’t make a huge difference. While you want to top off your glycogen stores with carbohydrates, it isn’t as important compared to shorter races. It’s such a long race that what you eat in the weeks leading up to the race and your nutrition throughout the race is going to dictate how your body responds. How should I tackle hydration? Try to drink small amounts on a consistent basis. Personally, I’m huge fan of CarboPro in my water with electrolyte tabs. Liquid calories can really help make up the calorie deficit during the race. While I like CarboPro, some people use other liquid calories like Tailwind, Infinit Nutrition, etc. Pedialyte is an amazing addition to keep electrolytes in check. Jason Antin’s biggest piece of advice: Keep shoveling coal into the engine! The general rule if that you should have half of your miles by 10 hours into the race. That seems to be the general trend throughout the past few years! Keep moving and have warm liquids between laps. Don’t wait to put on your wetsuit until you get cold, since it’s harder to warm up after the fact. Bring layers and a windbreaker that you can add on top of your base layers. You will be getting in and out of water for 24 hours, so don’t bring material that gets heavy when it is wet. Look at your goals. If you want 75+ miles, find someone to crew for you. There is usually someone in the community who is willing to help you out, even if they are helping out someone else out too. If you do not have anyone, utilize the Orphan Tent to keep you going. If you have your own site, having everything set up in Ziploc bags will keep you organized so you can simply pick up the bag and head out for the next lap. Use a hydration pack to carry more gear at a time. This will allow you to stay on course longer without having to stop. What differences should we expect in ATL? I hope that this will help many of you as you tackle this incredibly challenging and rewarding race. Please feel free to reach out with any further questions on Facebook or Instagram.